In prehistoric times, apparently these insects had 10 foot wingspans. 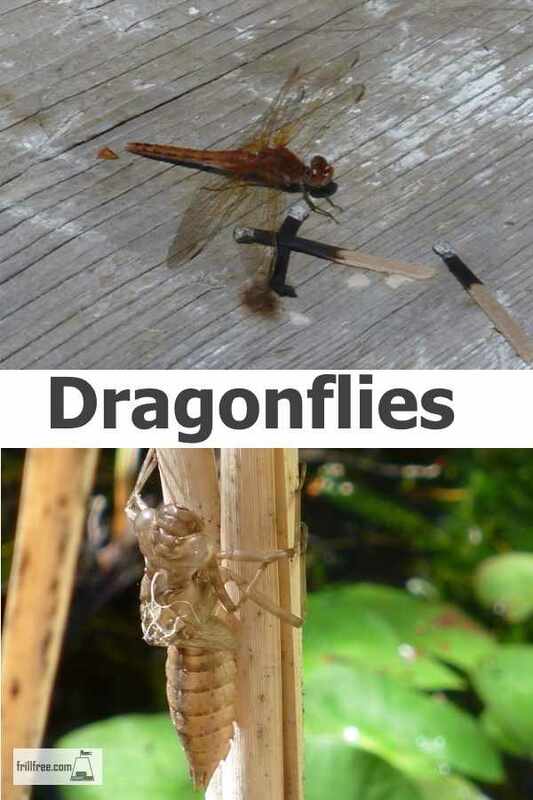 That's pretty scary, especially when you see them taking insects on the wing. They are voracious hunters, eating all kinds of pests, and the larvae eat many mosquito larvae. When I first saw the larvae of dragonflies, I had no idea what it was; I remember clearly watching this black bug thing climbing up a reed in the water, then stopping for a while. I was only vaguely interested, until I saw the back of it split open, and a dragonfly emerge with crinkled up wings. The cast off skin clung to the reed, and the dragonfly plumped up its wings in the sun, until they were fully expanded. After a few minutes, off it flew - a total of about five minutes after clambering out of its aquatic home. In my pond, they live for one to three years in the larval form. If I drag the filter for the pump out, I make sure I give them enough time to scurry back into the water because they will live only a few seconds in the air. The adult females hang around a pool of water, a river or a pond; their typical flight pattern is in squares or triangles. The males will be close by, patroling back and forth, sometimes hovering in place for a moment. When these both get together, their mating is astonishing; it takes place in flight, with the two intricately attached to each other. The females will lower their long body to the surface of the water from a log, reed or the side of the pond to lay their eggs, and then they go off to die.